NAVAL AIR SYSTEMS COMMAND, PATUXENT RIVER, Md. U.S. Navy officials accepted the 50th P-8A Poseidon (P-8A) aircraft at the Naval Air Station (NAS) Jacksonville, Florida. 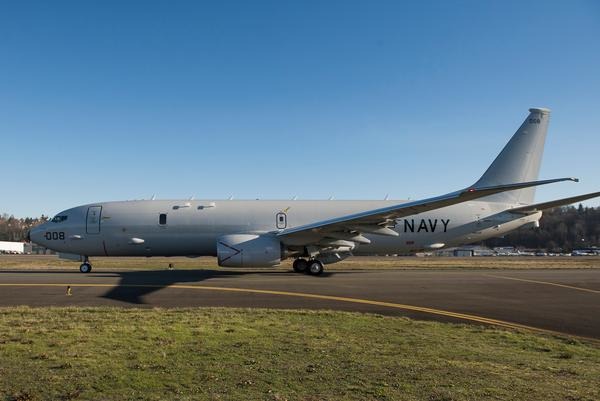 The P-8A program of record calls for a total requirement for 117 of the 737-based anti-submarine warfare jets. The fleet is expected to convert to the P-8A by Fiscal Year 2019. Officials say, the Navy's Poseidon is replacing the legacy P-3 Orion and will improve an operator’s ability to conduct anti-submarine warfare; anti-surface warfare; and intelligence, surveillance, and reconnaissance (ISR) missions. "The P-8A is special," says Capt. Tony Rossi, the Navy’s program manager for Maritime Patrol and Reconnaissance Aircraft. "This is the first time a Navy combat aircraft was built from the ground up on a commercial production line. We’ve leveraged commercial expertise and experience, and a highly reliable airframe, the 737, which has reduced production time and overall production costs." The program has reduced P-8 costs by more than 30 percent since the initial contract award. Officials say it has saved the U.S. Navy more than $2.1 Billion. "Together, we and our industry partners are transforming today's maritime patrol and reconnaissance force for the evolving threats and diverse mission requirements," he adds. "This replacement for the P-3C builds on lessons-learned, while enhancing those capabilities with unique features, such as an electro-optical/infrared (EO/IR) sensor turret and increased acoustic processing capability with 64 passive sonobuoys, 32 multistatic sonobuoys and concurrent passive and active processing." As of April 2016, all six active and one fleet replacement squadron at NAS Jacksonville have completed their fleet transition training from the P-3C to the P-8A and the first west coast P-8A squadron, VP-4, has relocated its home port from Kaneohe Bay, Hawaii to NAS Whidbey Island, Washington. All squadrons will complete transition training by Fiscal Year 2019. "I'd like to formally thank the team, including PMA-290, Boeing and our entire P-8A industry team, as we deliver the 50th P-8A Poseidon early and under budget," says Capt. Rossi.